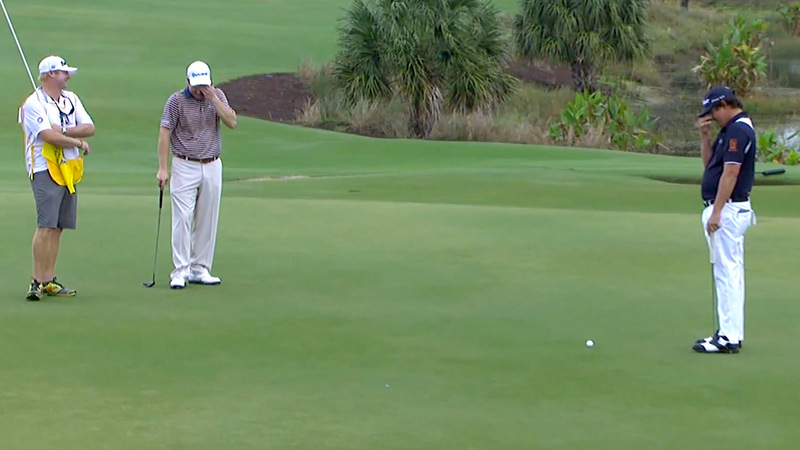 We’re guessing you missed the final round of the Franklin Templeton Shootout on Sunday. Like us, you were probably watching lots and lots of football. This event, part of golf’s "silly season," is played in a team format so Jason Dufner was paired up with Dustin Johnson. Dufner, who won the PGA Championship in August, was getting ready to attempt a birdie putt when he just tapped the ball sideways a few inches. We have no idea what he was thinking. The reactions by all the players were pretty great. Dufner also showed some skill by picking up and then hitting his ball into the water.